Dutch ovens and why every kitchen should have one. I was pretty clueless regarding Dutch ovens (also called French ovens by the Le Creuset crowd) until I became a huge fan of Cook’s Illustrated magazine, website and America’s Test Kitchen on PBS. 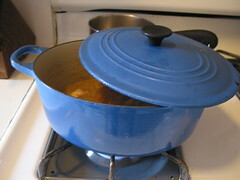 Since then I have learned that if there is one piece of cookware EVERY serious cook should have it is a good piece of enameled cast iron. I own a 7 1/4 quart Le Creuset oven in the cherry tomato color, but Lodge also makes an excellent Dutch oven at a fraction of the price and Tramontina makes a best-buy rated oven that can be picked up at Wal-Mart for about $40. I can honestly say that when I head into the kitchen to cook my Dutch oven is more than likely the first thing I grab from the cabinet, followed by my ingredients.